The liver is an organ involved in several essential functions, including production of bile and detoxification. It is also susceptible to damage and diseases, such as alcohol-induced damage and fatty liver disease. Flaxseeds are a good source of essential fatty acids and antioxidants, and their consumption is associated with many health benefits, including the safeguarding of liver health. Check with your doctor before taking supplements, especially if you have health problems or take other medicines. If you are overweight, or consume excessive amounts of alcohol, you are at risk of fatty liver disease. In this disease, fat accumulates in the liver cells and can cause cardiovascular complications. Rats fed flaxseed meal for six months had less fat deposited in their livers compared to rats fed casein or soy protein, reported the April 2003 issue of the “Journal of the American College of Nutrition.” Decreased fat deposition in the liver was observed in both lean and obese flaxseed-fed rats. Your liver routinely manufactures cholesterol and excretes some of it through bile. In the March 2011 issue of the “Journal of Medicinal Food,” researchers from Oklahoma State University documented the effects of feeding ground whole flaxseeds or flaxseed oil to ovariectomized hamsters. This operation normally results in raised blood cholesterol levels. It was found that in rats fed flaxseeds, this increase did not occur, but it did occur in rats fed flaxseed oil. 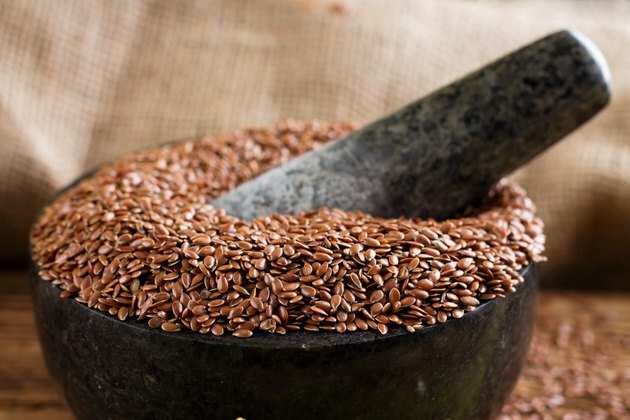 The authors suggest that whole flaxseed consumption resulted in increased bile acid synthesis, and this resulted in lower cholesterol levels. Your liver is the organ that handles and detoxifies harmful substances. However, it is liable to being damaged in the process. A rodent study published in the November-December 2005 issue of “Cell Biochemistry and Function” investigated the toxic effects of carbon tetrachloride in rats fed flax-enriched chow, compared to rats fed regular chow. The researchers found that flax supplementation significantly reduced carbon tetrachloride-induced liver injury. Protection in the flax group was more evident in male rats compared to female ones. The March 2005 issue of the “Journal of Cardiovascular Pharmacology and Therapeutics,” reported a study investigating the safety of consuming 37.2 g total flaxseeds daily for four weeks. Subjects were 15 healthy men aged 22 to 47 years. Among the measurements taken were kidney and liver function tests. The Canadian researchers found no deleterious changes after flaxseeds supplementation; however, blood triglycerides were raised. This can be an issue if you already suffer from high triglycerides. Your doctor will be able to recommend whether you should take flaxseeds or not.